Well from all the clutter, A-boards etc! 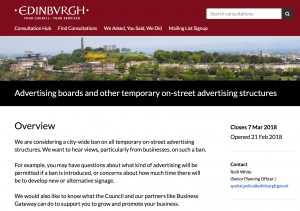 City of Edinburgh Council has a consultation out at the moment, and is looking for feedback on what the citizens of Edinburgh think on the issue. Not to prejudge but parts of Tollcross are like a slalon course between A-boards, tight width of pavements, trade waste bins. It must be so much worse if your visually impaired or in a wheel chair. Please take a few moments to feedback to the Council it really does make a difference. It closes on the 7th of March so much time left.